Discuss the measures taken by the current Labour government to enhance the independence of the Bank of England and the arrangements put in place to ensure its accountability. Are these institutional arrangements ideal? 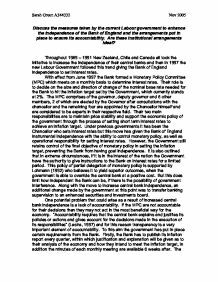 Throughout 1989 - 1991 New Zealand, Chile and Canada all took the initiative to increase the independence of their central banks and then in 1997 the new Labour Government followed this trend giving the Bank of England independence to set interest rates. With effect from June 1997 the Bank formed a Monetary Policy Committee (MPC) which meets on a monthly basis to determine interest rates. Their role is to decide on the size and direction of change of the nominal base rate needed for the Bank to hit the inflation target set by the Government, which currently stands at 2%. The MPC comprises of the governor, deputy governor and 6 other members, 2 of which are elected by the Governor after consultations with the chancellor and the remaining four are appointed by the Chancellor himself and are considered to be experts in their respective field. Their two main responsibilities are to maintain price stability and support the economic policy of the government through the process of setting short term interest rates to achieve an inflation target. Under previous governments it has been the Chancellor who sets interest rates but this move has given the Bank of England instrumental independence with the ability to control monetary policy, as well as operational responsibility for setting interest rates. ...read more. In this vein of thought another concern could be raised over the government's commitment to the independence process. With the measure put it in place the Chancellor has a great deal of influence over who is appointed to the MPC and could therefore fill it with political sympathisers whose decisions could therefore be heavily influenced. Policy conflicts may be regarded as a major concern when deciding on whether an independent bank is ideal or not. With the Bank dictating monetary policy independent from the government, co-ordination between monetary and other government policies could become more difficult. It is possible that a result of the Bank having operational independence would be to impart a deflationary bias to policy as the Bank has an overriding concern with hitting the inflation target and these actions may not benefit the whole economy. Therefore, it may be the case that giving the Bank a degree of independence is no guarantee of macro-economic stability in the long run; particularly as in solving one problem others may be created. For example, a low level of inflation which is caused by a restrictive monetary policy may have a detrimental effect on investment and therefore on economic growth as a result of high interest rates. Rogoff (1985) suggests that whilst and independent and inflation-averse bank will reduce average inflation it will also increase output variability at the same time, making for a more unstable economy. ...read more. Countries that have a more dependent central bank may not be successful in achieving price stability as other considerations may interfere with this objective such as employment levels. Therefore central bank independence makes a monetary policy dedicated to low levels of inflation more credible. There is no straightforward answer as to whether enhancing the Bank of England's independence is an ideal situation or not as there is a lot of evidence, arguments and support both for and against the Labour government adopting this policy. It seems that an independent and inflation-averse central bank delivers two main benefits in reducing inflation and eliminating politically induced output variability, which, in turn, have further positive effects on the economy. The general assumption seems to be that a bank less prone to political manipulation will behave more predictable, thus enhancing both economic stability and growth. In addition it appears that monetary policy under this regime has also proved to be more open and transparent than previously. But in contrast to this you also face the potential problems of policy conflicts and concerns over the competence of those chosen to be part of the MPC among others, as problems in these areas could lead to a less than optimal outcome for the economy. However, it is clear that the Bank of England have been successful to this point in achieving their objective set out for them by the current Labour government so, despite the general opinions on central bank independence, these institutional arrangements could be just as the Chancellor described them; 'a British solution for British needs'2. ...read more. high to the point mass numbers of people began to default on their mortgages which lead to the credit crunch as banks and investment firms became bankrupt this is can be observed on the diagram as inflation rate sharply decrease from the 3rd quarter of 2008.
to move to an alternative occupation. I will now look at how the government can achieve and maintain low inflation levels. Inflation is an overall increase in prices in an economy. This reduces the worth or value of money as its purchasing power falls. This meant that workers could now afford to remain unemployed longer, searching for the right job. Examples of seasonal unemployment include construction work, agricultural and holiday industries where demand is less in the winter months - these workers are only unemployed at certain times of the year. If unit wage costs rise, this will eventually feed through into higher prices (this is known as an example of ?cost-push inflation?) Commodity prices: Changes to raw material costs and other components e.g. the world price of oil, copper, aluminium and other inputs in many production processes will affect a firm?s costs. This debt can be ?toxic?, as money received through tax revenue wouldn?t be used by the government to stimulate economic growth through certain policies, but be used to pay back the interest on the borrowed money, which in yearly periods would amount to a massive amount, significantly more than the amount actually borrowed.